Here's the third and final post in our three part series on how and why certain kids get to play key positions such as point guard, pitcher, and quarterback. In this post, we take a look at how pickup games can help your child develop key skills, and the role you play in helping your child become a better player. In the prior two posts, we discussed some reasons why a child is selected to play a key team position, and also discussed the role coaches and organized sports play in the development of the skills needed to play these positions. As mentioned, organized sports programs cannot realistically give each child equal time in key positions. But there is still an alternative for each child to develop their skills—self-directed pickup games. And there are also other ways in which you can provide your child the best opportunity to succeed. These games usually vary in their level of competition. 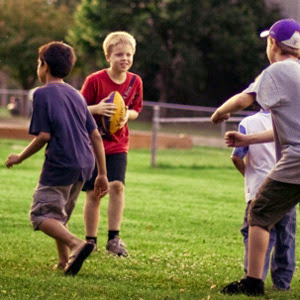 Different groups of kids provide different opportunities to play various positions and team roles. With older more experienced children, your child may play a relatively minor role. “Fairness” is not usually the primary concern of children in these games. Kids want to compete, have fun, and make sure that they have enough players to play their game. In balancing these needs, they decide who plays what position. And this usually means the young beginner doesn’t play the key positions until he or she demonstrates the necessary abilities. But in other games with younger, less talented players, your child may be the "best" point guard, pitcher or quarterback for that group of kids. In these games, your child has the opportunity to develop his or her abilities in the more important positions—to put into play the skills taught in organized sports programs and individually practiced. And when your child returns to organized play the next season, he or she may be ready to play a key position at a more competitive level. This is one of several reasons why parents should promote opportunities for their children to engage in self-directed pickup games. Besides providing your child with the opportunity to play in pickup games and participate in a good organized sports program, what else can you do? If you played your child’s sport when you were young, you may be able to provide valuable skill instruction and guidance. It’s no coincidence that a high school coach’s son or daughter often develops into a skilled player deserving of a key position and team role. At an appropriate age, individual lessons from a skilled instructor may also benefit your child. These instructors can provide tips, techniques, and insights that a child would not necessarily learn on his or her own (or from a volunteer coach within the typical organized youth sports program). And finally, try to maintain a balanced perspective on your child’s journey in sports. Fight for your child’s opportunity to grow and be his or her best. If you feel your child’s coach is unfairly favoring other children, pull the coach aside and discuss his or her reasons for placing your child in a more minor team role. The coach may believe it’s in your child’s best interest to play a team role in which she or she can enjoy some success. Also, understand that a fun, successful sports experience for all of the team’s players may require your child to now play a certain role. As your child matures, learns new skills, and demonstrates talent, opportunities will naturally emerge for your child to play a more important team role on his or her organized sports teams. Those pickup games are so important because kids learn how to run themselves. If you aren't there screaming at them to hustle. Or the coach isn't there to call every play can they still play their best? Pickup games should be about the game itself. Have fun, make mistakes, learn a few things. All without the pressure to perform. Pickup games are great because they give kids the chance to play and make mistakes in a low-pressure situation. There are no coaches screaming, no parents judging---it's just them and their buddies and the chance to do great or fail all on their own.